1955, July 18 - Locomotive and 27 freight cars derail at Maxville, Canadian National Alexandria subdivision. This was the scene from above near Maxville after a CNR freight train smashed through an open switch. Twenty-nine of the 32 cars wpre derailed and tossed like toys atop each other in a scene of awesome damage. Miraculously, no members of the crew were injured in the spectacular wreck. The 250-ton locomotive rammed through 125 feet of earth smashing through a coal shed before it came to a shuddering stop at a grotesque angle, half-buried, as shown here. Adding to the damage were casualties among livestock in cars on a nearby spur line. The hurtling freight smashed them to bits. Two dozen freight cars were reduced to a splinted mass of waste wood and twisted metal but the five-man crew escaped unhurt, when an Ottawa bound CNR freight train thundered through an open switch at the station and turned over here late last night. Only victims were some Livestock in cars on a nearby siding. Only three of the 32 cars remained on the track in the resulting wreck five more cars at the rear of the train remained upright but off the rails, the remaining 24 Freight cars being demolished. The 250 ton Northern type locomotive (no 6101)plowed through 150 feet of earth, smashed through a coal shed before it came to rest tilted at a 45 degree angle, half buried in the soil. CNR officials said this morning a passing track had been put in operation at the scene and rail traffic would not be held up. The main line is expected to be cleared by tonight. "A bombing by an enemy could not have caused any greater destruction. I don't understand how we escaped alive", Simon Gilbert McElroy of 108 Concord Avenue, an RCAF veteran, told the citizen, as he inspected the wreckage. It was a bizarre scene. That any one person, let alone five escaped, was unbelievable. Huge box cars, 20 of them heavily loaded had been tossed about like paper toys in a whirlwind. They were heaped on top of each other five and six high like ragged piles of splintered firewood. Three loaded livestock cars on a nearby spur line were smashed to bits by the hurling cars and flying debris. Many of the valuable cattle were injured and will have to be destroyed. 42 hogs were crushed to death in a standing car that had been loaded only one hour earlier. Heavy steel rails, 30 feet in length, lay twisted on the ground like so many pretzels. Telephone and telegraph poles were uprooted by the impact of hurting boxcars, dragging webs of wire with them. 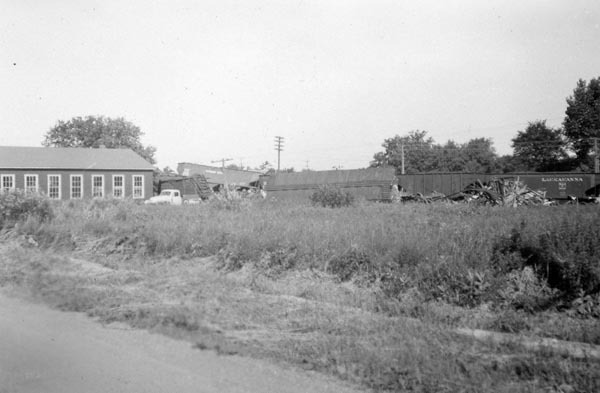 Splintered wood and metal box car parts were strewn for more than 150 feet from the wreck, and freight car carriages were resting helter skelter about the station. Telephone service from Maxville to Ottawa was cut off and only essential phone calls accepted. They were rerooted over a single line by Winchester. Despite his own danger veteran engineer Thomas Bradley of 31 Main Street, took time to cut off the live steam that might have endangered fireman McElroy and Brakeman Charles Bud Leslie of 105 Rosemont Avenue, who were in the cab with him. The train was in charge of conductor Frank Norton of 57 Harold place. The fifth member of the crew was Brakeman Joseph Lynch of 448 Pleasant Park Road. The wreck happened at 11:35 p.m. when the train, Advance 401, was 4 hours out of Montreal. It was due in Ottawa an hour later. Damage was placed at $250,000. At the time of the wreck the train was traveling at an estimated 50 miles an hour as it passed through Maxville station. "I was just looking ahead on the tracks, and when about 90 feet from the switch I saw something was wrong. By that time it was too late. It would have taken at least a half-mile to pull the train to a stop." Mr. Bradley told the citizen reporter who drove him back to Ottawa several hours after the smash up. "Anyway I did try to bring it to a stop, but there was just no track left. The engine tilted at a crazy angle throwing me clean across the cab. Seconds later it was plowing into the ground, the wheels still going. "I closed down the throttle, and shut off the valves. Then we all got out. When I climbed out of my window and saw what did happen I could hardly credit it. I have spent 32 years in the business and this one beats all," he said. Simon McElroy has had many mishaps in his lifetime but they all paled compared with this narrow escape of last night. "I was a gunner in the RCAF and was in three crash landings and had to bail out once. About a year ago I was badly hurt in an auto smash near Renfrew, but how I got out of this one alive I'll never know. "About a thousand wild thoughts came into my head when the engine rolled over. Not one of them was promising, believe me," the brakeman stated. A third member in the cab Bud Leslie, shared the same thoughts as the other trainmen. "It all happened too fast to be scared, but I was shaking enough when I got out and looked around. Life can seem good at a time like this," he told The Citizen. G.T. Dunn, CNR superintendent the Ottawa district arrived at the scene of the wreck to inspect the damage early this morning. He reported that an investigation will be launched immediately. As he surveyedhe wreckage Mr. Dunn expressed his deep gratitude that all members of the crew escaped unscathed. "It is hard to believe when you see the damage," he admitted. The superintendent lauded the cool action of the engineer during the crisis. "He acted wisely and bravely. That might have been even more serious consequences if he had not followed the line of action that he did in shutting off the steam," he said. The wreckage blocked off the main CNR Ottawa-Montreal line temporary. Wrecking crews for rushed to the scene from Ottawa, Alexandria and Montreal, and were at work less than 2 hours after the smash. Maxville July 19 - 27 Freight cars and a 200-ton locomotive were piled up in twisted wreckage in the Maxville rail yard when the Montreal-Ottawa freight was derailed at 11:35 p.m. Monday. An investigation is underway to determine the cause which is believed to have been an open switch. In what railway men called "a miracle", five Ottawa crewman crawled unhurt from the derailed train. The express left rails, skidded 100 yards beside the tracks at a crazy angle with the engine plowing a six-foot ditch in the railyard cinders. It then smashed into a coal and feed storage shed besides the tracks and demolished half of the steel-sheathed frame building. Station agent Myron Marshall who had stepped outside his station as the train went by was rained with flying debris. He stood injured. Inside the engine cab engineer Thomas Bradley, 53, of Ottawa, remained to shut off the throttle and valves before he pulled himself through the window to safety. Today the engineer's quick action was credited with saving a disastrous boiler explosion and greater damage. As it was a conservative estimate of damage was $250,000. The train was the advance 401 which left Montreal at 7:30 last night. It was to arrive in Ottawa at 12:35 am. The freight had no stop to make at Maxville and it headed through the town out of the night at 11:35. The main CNR Ottawa - Montreal line was expected to be cleared tonight. A passing track remained in operation and no passenger train re-routing was necessary. Workman today were unscrambling the jack-knifed coal cars and steel box cars strewn over the rail yard. Three wooden stock cars which held calves and hogs loaded at Maxville only half an hour before the wreck were also smashed. 40 hogs owned by O.V. Villeneuve, of Maxville were killed. G.T. Dunn, Ottawa division superintendent for the CNR, came to the scene of the wreckage early this morning. The wreckage of Monday night’s spectacular derailment at Maxville, when 27 freight cars and a 200-ton locomotive plunged off the CNR main line in front of the railway station, is being cleared away, but the destruction wrought by the hurtling train continues to draw hundreds of spectators to the scene. Canadian National Railways officials have stated it was a miracle no one was killed when the engine left the rails at a switch just west of the station. The locomotive plowed a six-foot trench in the rail yard cinders, and telescoped steel and wooden boxcars behind it in a jumbled mass. The engineer, fireman and brakeman remained in the cab during the wild five-second ride after the train left the tracks, going about 50 miles an hour. Engineer Thomas Bradley of Ottawa received only a scraped thumb remained in the cab after it stopped, to shut off his throttle and open valves. G. T. Dunn, Ottawa division superintendent, had high praise for Bradley, whose action probably prevented a boiler explosion that would certainly have been fatal for the men. Total damage was conservatively estimated at a quarter of a million dollars. less than half an hour before. Railway officials are now probing the cause of the accident, and early indications point to an open main line switch as the cause of the derailment. After jumping the tracks at the switch, the train roared into the coal and feed storage shed of Maxville Feed and Seed Company, owned by Reeve W. A. MacEwen. Half of the steel-sheathed frame building was demolished. The engine came to rest with its pilot burrowed five feet in the ground. Behind it, shattered boxcars and twisted steel rails made a shambles of the main line. The derailment occurred at 11.35 p.m. and an hour later, enough of the wreckage had been cleared off to allow trains to pass on a siding. The main line was still not open today. 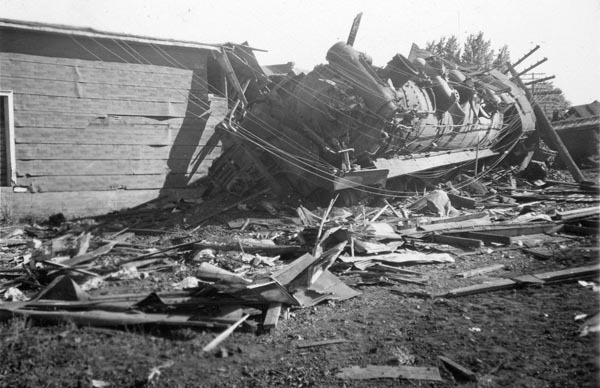 The wrecked train, advance 401 out of Montreal at 7.30 p.m., was in charge of conductor Frank Norton of Ottawa, with Joseph B. Lynch of Ottawa as rear-end brakeman. It consisted of 32 cars of mixed freight. Both the conductor and brakeman Lynch were at the rear of the train and escaped injury. Several cars following the engine off the rails plowed into three stock cars on a, siding containing cows, calves and pigs. The car holding 40 pigs was demolished and 25 of the pigs were killed. The concrete station platform was deeply gouged by the wheels of the bouncing cars and lamp standards and Bell Canada long distance lines bordering the track were broken off. Station agent Myron Marshall who had just stepped outside was showered with debris but he was unhurt. Long distance communication between Ottawa and Montreal was disrupted but repair crews had lines back in working order by the next afternoon. Several extra CNR wrecking crews and railway policemen were brought in within hours of the crash and the work of clearing the track began. It is expected the locomotive, which carried 11,600 gallons of water and 18 tons of coal in its tender, will be righted Friday.